A hovel away from home. There is a sameness to their dingy charm, yet each has a personality, like a group of hobos squatted around a jungle camp fire, each with a story. The duck shacks I've been in over the years stretch the length of the migration route, but they all share common traits. They have age on them, like most of the hunters who come there, although the grizzled hunters are careful to bring along some sprouts to learn what life really is all about. But there is no such thing as a "new" duck shack. If it's hooked up to city water and sewage, chances are excellent it's not a duck shack. The dogs are a mix of gray muzzles and bumptious pups. Labrador retrievers are a given. They are the canine personification of the place and no matter how often the rare fastidious hunter mops there will remain a few muddy paw prints. The linoleum manufacturers should have offered a muddy print pattern 50 years ago, which is when the linoleum got laid in those shacks that don't have worn bare wood flooring. The last shack I visited had a pair of Labs, a chocolate lady of seven years with the manners of Queen Elizabeth, and a rowdy pup who, when we were out hunting, visited the trash bin in the kitchen and strewed an assortment of plates, coffee grounds, cans and bottles halfway across the kitchen and into the living room. The shack's proprietor, said, "That's the third time he's done it. You'd think he'd learn&apos;¦or his owner would. I'm not mad at the dog, but the guy that owns the dog is gonna clean it up." The pup hid out and the owner would have, except he was busy with a trash sack and a grim expression. Almost all true duck shacks are decorated with photographs, mostly taken many years ago and gone sepia with age. Generally several hunters group around the tailgate of a 1950s Chevrolet or Ford pickup (those were the choices then) on which rests a lineup of dead geese or ducks. They all are young and smiling--the hunters, not the waterfowl. I remember one shack in particular. An old, old man sat on his throne, a creaking rocking chair. He was king of the shack. His name was Wayne Steinbeck and he had lived on Yellow Creek, just across a muddy ditch from Swan Lake National Wildlife Refuge, since the refuge began in 1945&apos;¦and years before that. He had bought his cabin and 80 acres for $1,600 in 1927. The 11,000-acre Refuge began 10 years later and hunters swarmed to the land around it. Today you couldn't afford any acreage if you were Donald Trump. It was a shack with personality. A cracked pintail call, trailing a darkened leather lanyard lay on a shelf, alongside a photo, curling and brown, of some hunters with a bag of ducks and self-conscious grins. 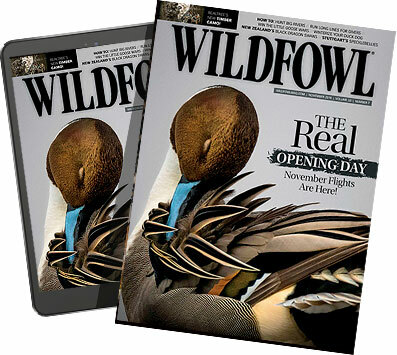 There were framed pictures taken from the calendars of shotshell manufacturers or clipped from outdoor magazines, pictures of ducks settling in to decoys or Canada geese gliding toward frosty corn stubble. Most of it wasn't great art; some of it wasn't even very good art, but it fit the mood of the shack and it was not chosen for artistic value but because the artist had triggered a cherished memory, had evoked a sweet morning from the past when good friends hunted together. "We was pals 15 yrs	what a pal and always a friendput to sleep at Marceline a.m.Tumor in jaw getting hard hearingAnd eyes getting badBuried up at Marceline dug up the next dayMade a box for him and I had him brought Back to his homeDon't disturb everHow you miss em"
The shack smelled of turnips because Steinbeck loved the awful vegetables and invariably fixed a mess of them for visitors. If there was an upside to that for a visiting hunter confronted with turnips for lunch, it was that Steinbeck was nearly blind and could not see how much the finicky hunters ate. It certainly was not an upside that he had gone blind because he loved the sunrise and the Canada geese that set their wings for his decoys in the fields bordering the refuge. He loved to see the pecan trees bordering the muddy road into his shack and he even loved the occasional high water that flooded the road and isolated him for days at a time in his shack. He had plenty of turnips. He still was hunting when he was 85, his vision dimming. When he hit his 90s he'd lost his vision, but not his love of the old shack&apos;¦or of turnips as I found when I revisited him. They stank up the shack but actually tasted pretty good at lunch. Maybe it was that I shot a Canada goose that morning and anything would have tasted good. Or maybe I was getting more tolerant. I went back once more in 1980. Wayne Steinbeck had died at 93 and I paused at the dogs' grave site and at the cabin where decoys were stacked on the porch. The rocker was empty. Maybe somewhere Steinbeck and his dogs are reunited in a place where all hunters have keen eyesight and all dogs are young. Maybe even today at the sound of Canada geese disturbing the still, cold, star-shot winter nights there is the ghostly thump of a sturdy tail within the old shack. That was a sweet, sad shack. Not so the Milonski farmhouse a couple miles away as the duck flies. Mike Milonski was a bear of a man who came from a family of bears. He was Polish and proud of it. He never met a stranger. His staff, first when he was chief of the Missouri Conservation Department's Wildlife Division, and later as an assistant director, loved him. Once a prominent woman anti-hunter came to town to protest something or other and Mike greeted her with a hug and a booming welcome and you could see her (and her protest) melt. He did it with everyone. He was a natural in an often unnatural world. He could lace his conversation with cusswords and it was so in character that no one noticed. His shack, a shambling two-story farmhouse on the west border of Swan Lake, was, like Mike, shaggy and filled with rough edges. The Milonski farmhouse, even though it was big and two-story, was a shack and it was a rare treat to hunt there, although occasionally hazardous. The place had stoves that were as dangerous as playing soccer with bottles of nitroglycerine. The propane cookstove was in an added-on alcove which, fortunately, had thin outside walls. A friend once tried to light it to cook supper and the stove exploded, blowing him through the wall into the back yard. They got a new stove, but my buddy gave up eating hot food. I was there when the heating stove began leaking oil until there were puddles of it everywhere. We managed to get it shut down and spent the night shivering, both from cold and from the fear that someone would strike a spark. But this was an explosive shack on the edge of Paradise. Swan Lake Refuge topped out at about 180,000 Canada geese each year, and ducks swarmed to a pit blind in a crop field across a drainage ditch from the shack. The only problem was that Milonski, who gave up being afraid of anything long before, would load a miniscule boat with several dozen decoys, several hunters, a couple of massive Labs, shotguns and possibly the defective kitchen stove and cross this deep, dank moat in the pitch black of pre-dawn, water lapping at the gunwales. I crouched in the boat, feeling as heavy as a tugboat anchor, just waiting for the boat to flip. Swimming in December isn't my idea of sport. Shooting geese and ducks is and it was worth a frightening trip on the Titanic to get to the pit blind and wait for the sun to rise. You could hear the roosted geese shouting to each other by the thousands. The Milonski house featured sagging double-decker bunk beds that creaked and groaned in the night, much as did most of the hunters who tossed fitfully in them. There were photos on the wall, one I remember of a revered lady biologist riding the shoulders of some brawny hunter, waving a beer bottle. Another featured a Conservation Department commissioner caught on the throne. He was saluting the camera with an obscene gesture. One hunter wrote a song called "Up In Mike's Place" which had the tag line, "There's gonna be a party up at Mike's." Few duck shacks have their own anthem. Mike's place had what amounted to a revolving door, open to kings and peasants alike. One of the peasants, I once fell for the world's oldest gag. "Here's a Polish duck call," Mike said, handing me a horn shaped like a French horn. "Blow real hard!" Since Mike was Polish, I didn't associate it with the infamous Polish jokes and dutifully blew hard&apos;¦and a cloud of talcum powder erupted in my face, choking me and clogging my eyes. "Geez," Mike said. "I never thought you'd go for it." One day Winston Milonski, Mike's wife, left on vacation with some other women and got no more than 15 miles from home before she was in a terrible accident which nearly crippled her. She recovered, but the Milonskis decided that life was too short and unpredictable to waste on bureaucracy. Mike, by then, was an assistant director at the Conservation Department, maybe in line to get the head job. But he chucked it in and they moved to Florida, coming back to Missouri only when the waterfowl season opened. Winston had cut Mike's hair their whole married life, but she went on strike and he began to look like a big ol' lion, except his roar was laughter, not menace. Mike's place rolled on and so did Mike until he caught what he thought was a case of the flu. It didn't get better and finally he grudgingly gave in and saw a doctor. The news was awful. Mike came home to Mike's place and sat on the porch and watched the sun set over the Grand River, watched the geese setting their wings as they roosted over the canal in the corn stubble fields. Duck shacks have a commonality and the heating system seems to be part of it. One I remember featured a furnace in a dank cellar reached through a trap door. If the furnace had been able to talk, it would have said, "Thermostat? What's that?" The only temperatures it recognized were Polar and Seventh Level of Hell. And it groaned in the night as if there were doomed souls chained below us. If you stay in a place that has a quietly efficient furnace and a working thermostat, it probably is a lodge, not a shack. Check the corners of the rooms--if they're clean it's a lodge; if they have duck feathers and indefinable substances windrowed out of the reach of a worn broom&apos;¦it's a shack. I hunted a legendary duck lake in Mississippi. Gadwalls and mallards dropped through a break in the flooded cypress trees and we shot until we limited. It was the hunt you imagine when you're about to fall asleep on a sagging cot in a duck shack. But I stayed in a casino hotel with gold elevator doors, a bed big enough for an NFL pulling guard, a bathroom with fresh bars of soap every day and a flat screen television that actually got more than one channel showing Lawrence Welk reruns. My buddy Spence Turner wasn't there to drop his sweaty socks on the kitchen table beside my sandwich, sink into a battered chair and groan, "God, that feels good!" As a hunt it was great; as an experience it lacked something.